I got it! Thank you so much for your help! I will be watching the site and try to help others! It is awesome and so helpful!! I need all of your help!! YOUR GOING TO THINK I’M CRAZY BUT…Paisley has become attached to this stuffed elephant! It was sitting around the house for months, and then one day she picked it up. Now, we can’t go do anything without “Ellie”, or how how she pronounces it “EL LA”. She goes around the house calling for it. We can’t eat, play, sleep, or drive without her! So I decided I would just go get some reserves… so if something happened to “EL LA” we would have a back up! WELL- no so luck! They are a collector’s stuffed animal so Walmart only put out so many of each animal. So this $5 stuff animal now cannot be found! ok– I have included pictures! • it is about 12 in. • but the tail is the most important! (that is what she holds!) it is skinny! OK.. I know I sound a little crazy! But seriously, She is so attached to this thing! I’M SO WORRIED ABOUT WHAT I WOULD DO IF IT WAS LOST! Maybe it will be at another Walmart! Isn't lovable Huggable a Dan Dee plush found at Walmart? I think you're right Tami, but I'm not sure. I believe that this stuffed animal is on eBay right now. You can "buy it now" from the seller for $9.99. The eBay item number is 330314542873. I truly hope that this is the item you are looking for. I hope you get it!!! Yes I hope you can get the $10 one off Ebay. The odds of someone going out to Wal-mart and purchasing this and shipping it to you at no profit to them is unlikely. Great Sellers on sites like this one, Bonanzle, Craigslist, Ebay, etc would not be able to afford to make a living if they were not able to make some sort of a profit off of their sales. I personally hate Wal-mart to the point you would have to pay me extra just to fool with going in there and bothering to ask an employee who will have no idea what your talking about and them standing in 1 of only 3 open lanes and waiting for 10 minutes to checkout. I don't think I have ever just run in and out of that store lol. 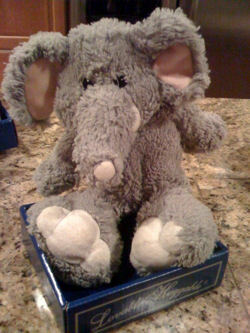 So this is hysterical that I was just searching for a duplicate for MY DAUGHTER's Grey Stuffed Elephant named…ELLIE …and found you looking for the very same thing. I'm glad you were able to find one and I thought maybe you have other responses to your plea and was hoping some how you had some "Ellie" connections. My daughter had the same exact thing that my husband bought for her a year ago and though she has many stuffed animals this was her absolute favorite and some how we lost it. She still asks about it all the time. I have searched the internet with no luck. SO ANY LEADS WOULD BE GREATLY APPRECIATED! and believe it or not my name is Amy as well. You need to Contact us Amy, so we can help you find it. Yes my daughter has the same elephant and lovie is giting wore out and she won’t have anything to do with another one . I have Ben desperately looking for another one for her if anybody know where I can find one new or gently used I’d really appreciate it .